In the years between 1931 and 1956, Epiphone used quite a variety of tuning machine models – single units and strip units, with open and enclosed gear, with metal and plastic buttons, gold and nickel plating, etc. – not easy to keep an overview. And as we will see, the devil is again in the detail: Some easily overlooked features are often relevant to identify the manufacturing date of a tuner model – and to determine if the machines are original to an instrument in question. Grover: Albert D. Grover was an inventor of musical instrument parts since the late 1800s. By 1929, A. D. Grover & Son had a factory in Long Island City, NY. In 1952 the company was succeeded by Grover Musical Products, Inc., Cleveland OH. Waverly: Waverly Musical Products Co., Inc., based in Long Island City, NY, was founded in 1918. In the 1970s, the brand was acquired by Stewart-Macdonald, Athens OH. 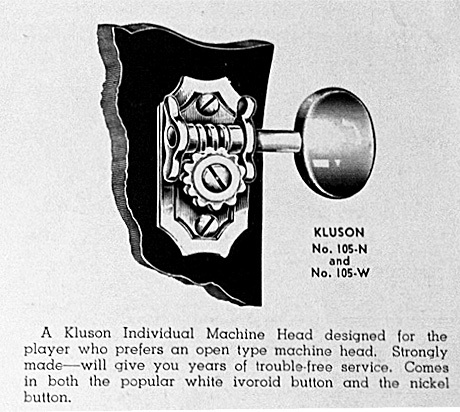 Kluson: In 1925, John Edward Kluson founded the Kluson Manufacturing Company in Chicago IL. The company went out of business around 1981. The Kluson brand was acquired and revived in 1993 by Larry Davis, WD Music Products. Regarding tuner models in general, I owe a lot of insights to discussions on the invaluable Unofficial Martin Guitar Forum (UMGF) – with experts such as John Arnold, Jim Dulfer, Willi Henkes, Greig Hutton, Steven Kovacik, and others – a big thank you! Some of the images are borrowed from there, too. In this text we focus on the tuner models used on 6-string guitars and on lap steels. On 4-string tenor/plectrum guitars and 8-string mando family instruments we often see the same single units, while these instruments also used some strip tuners not featured here. Dating/originality caveat: Tuners are parts that tend to wear out, so they are often replaced during the lifetime of an instrument. 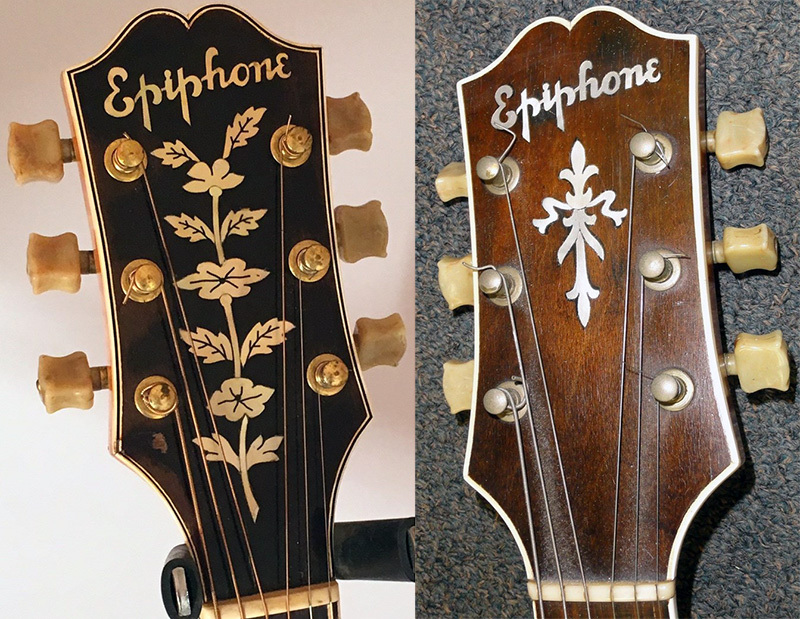 When an instrument went through a refurbish at the Epiphone factory, tuners often were updated, too. While (later) replacement tuners are often easily identified by their "incorrect" model features, in some cases it is more difficult to identify a tuner as non-original to an instrument in question – especially when the replacement unit appears to be of similar vintage. Also to consider: At the factory, new instruments typically received tuners shortly before shipping; while some instruments of a production batch (serial number range) sold quickly, others were obviously shipped months or more later – sometimes receiving an updated tuner product. 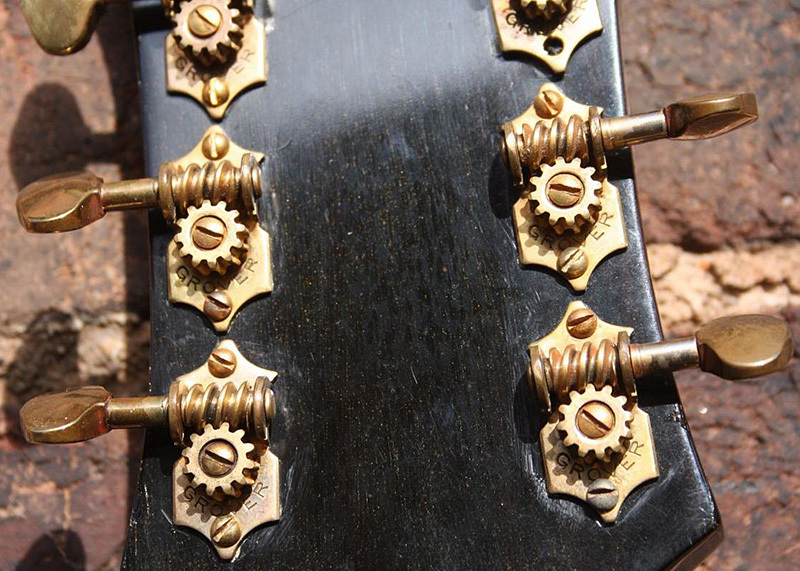 This overview part 1 covers the tuning machines introduced on Epiphone models between 1931 and 1939 – the upcoming part 2 will describe the tuners introduced by 1940 and later. 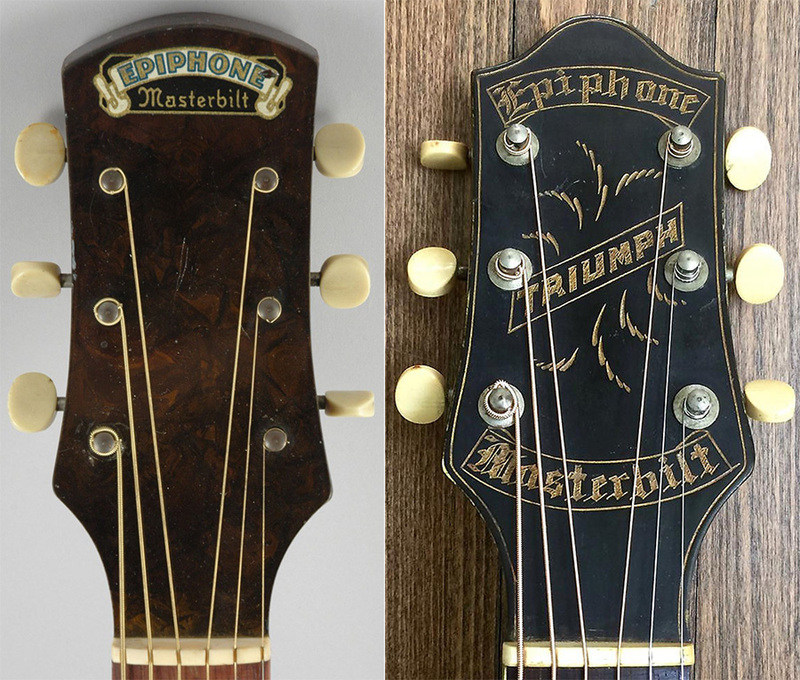 These plain strip tuners can be found on many of the earliest Epiphone Masterbilt models – even on some Triumphs, and all models below –, however after 1933 mostly on low-end models such as the Olympic until 1939. 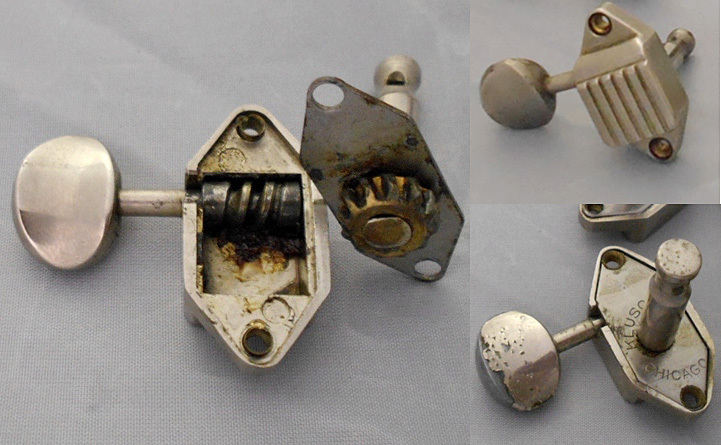 Although these tuners are unbranded, we assume they were made by Waverly due to the design of the cog and worm gear. 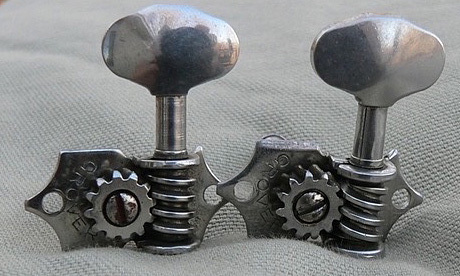 While lower-end Epiphone models – like the 1933 Olympic below left – typically didn't have tuner bushings, round bushings were used with these tuners on the 1933 Triumph on the right. 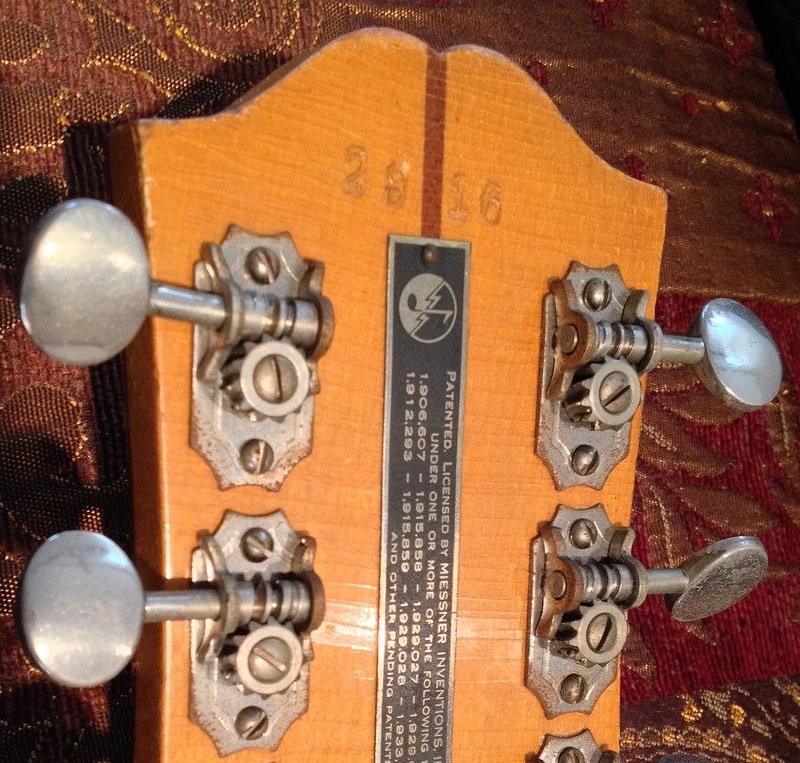 These single tuners with clipped plates were the standard units on the higher Masterbilt models until 1934, and used until 1937. Like with the strip tuners discussed above (1. ), there is no brand name – however the details of the cog and worm again suggest manufactured by Waverly. These tuners often get mistaken for a Grover model (see 3.) which they obviously tried to emulate. However note differences such as a higher tuning ratio of 12:1, shape of the buttons, and other details. 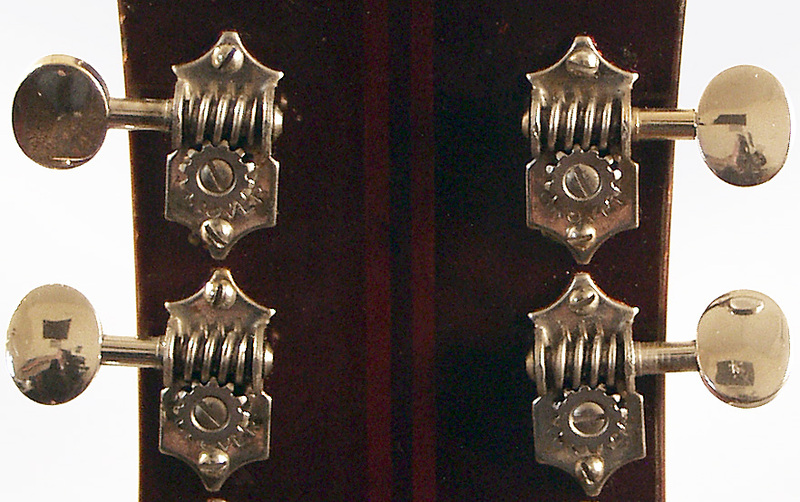 Pictured above nickel-plated Waverlys with metal buttons on a 1933 Royal, below gold-plated examples on a 1931 DeLuxe. 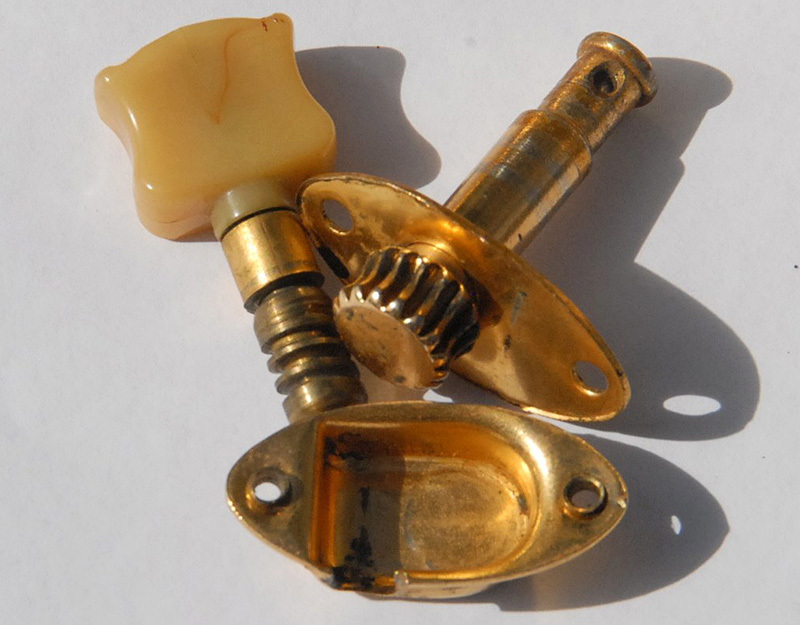 Gold-plated Waverlys were common on high-end Epis until 1935, but eventually replaced by gold Grovers (see 3.) on these models. Pictured below a DeLuxe and Royal, both from 1933 – note the round bushings. 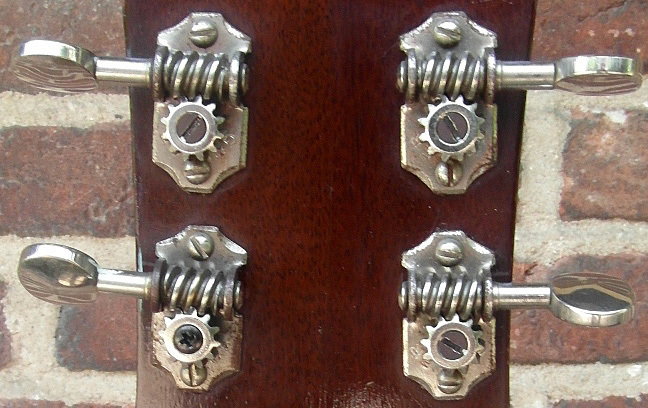 At some point in in 1936, these Waverly tuners changed their shape: The tips of the clipped plates became much wider (see picture below from a late 1936 Blackstone). 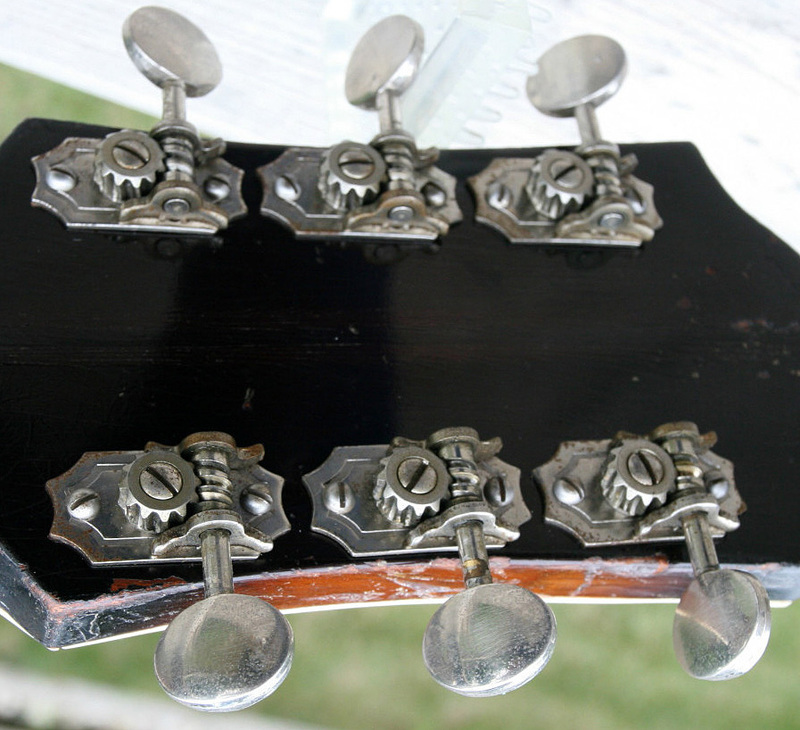 This short-lived variety – seen on Epiphones in nickel plating only – was used until 1937. While Grover-made tuners were actually the "original" of the single, clipped-plate tuner style, Epiphone nevertheless began to use them on their Masterbilt series only around 1934 – while on earlier instruments we typically see the copycat Waverlys (see 2.). The Grover company was obviously aware of the imitation product, as an advert from the April 1935 issue of "Metronome" magazine suggests (pictured below left). At the time, Grover proudly promoted their "rapid" tuning ratio of 6:1 – however this feature proved unpractical and was eventually discontinued (see 4.). The high-end version of this tuner was the Model No. 98 (often dubbed G-98), with its distinctive scalloped button – below right on a 1934 Tudor. Below Grover models as they appeared in the 1935 catalog of Grossman Music Co., Cleveland OH. The "professional type" with scalloped buttons listed as No. 98 (No. 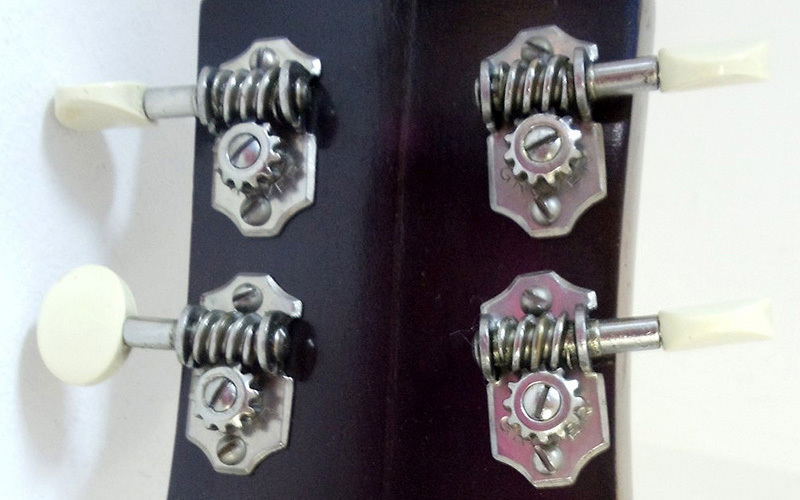 97 for slotted headstocks), the "standard type" with round buttons as No. 100 – available in 7 options. 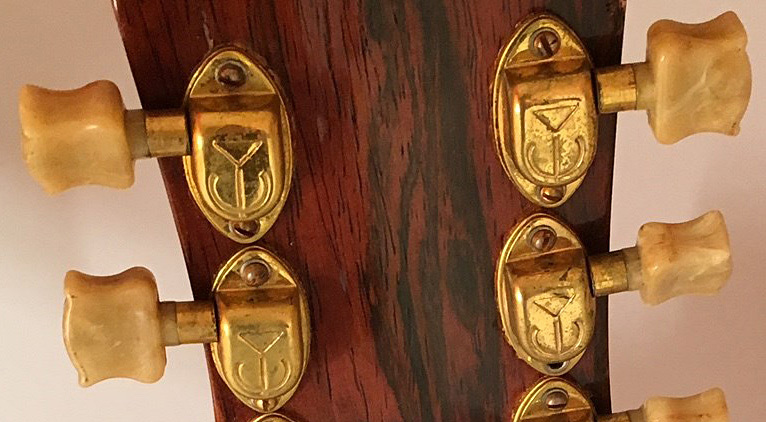 Below gold-plated G-98 tuners, as used on some of the high-end Epiphones by 1934: Early features include the riveted cog, and the thinner, seamed version of the scalloped button. With Grovers, bushings (if present) are the hexagonal type. 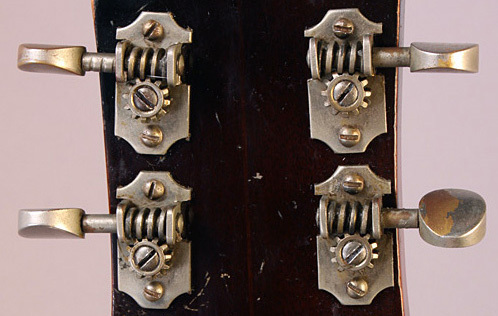 By 1935 the cog was screwed to the string post – see the nickel-plated version with oval buttons on a 1935 Spartan, pictured below. Note the "Grover" name on the plate – here stamped upside down. On lower models, white plastic buttons were used – below on a 1935 Blackstone. 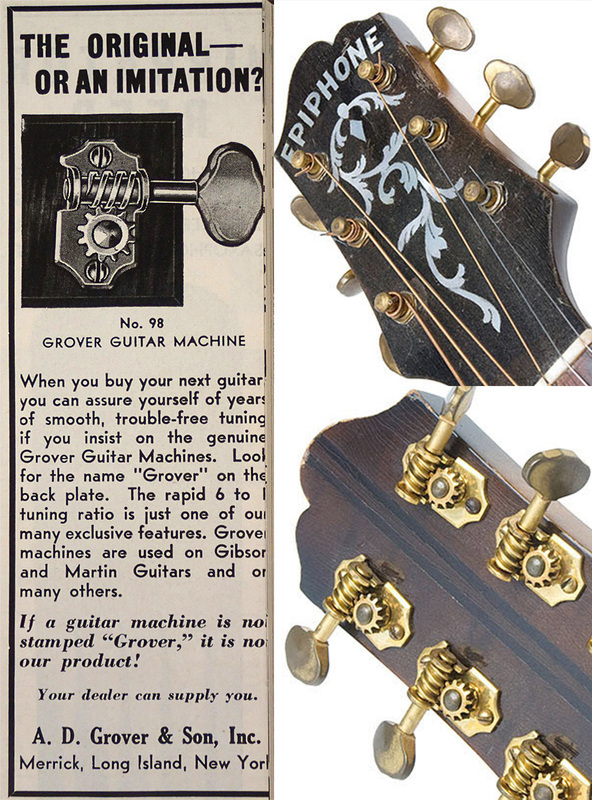 By 1936, Grover had redesigned their successful tuner model – the plate now ending in sharp points. Around 1938, there was another significant change: The tuning ratio of 6:1 was changed to 12:1. 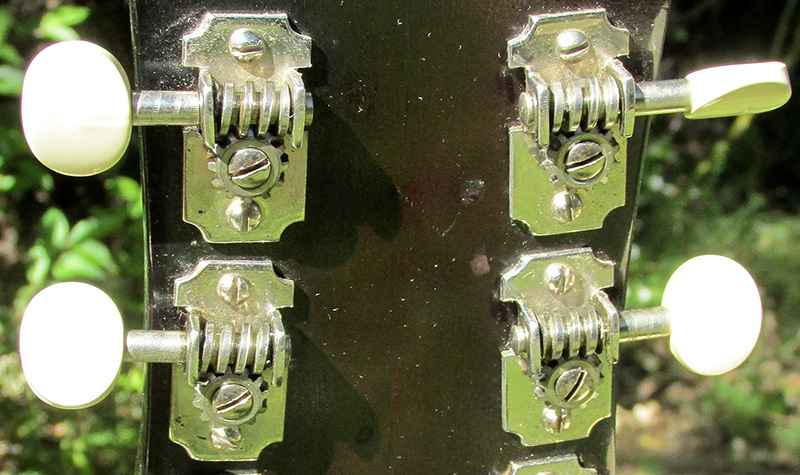 Pictured below a pointed-plate Grover (left) next to an older, clipped-plate example – both with 6:1 tuning ratio. 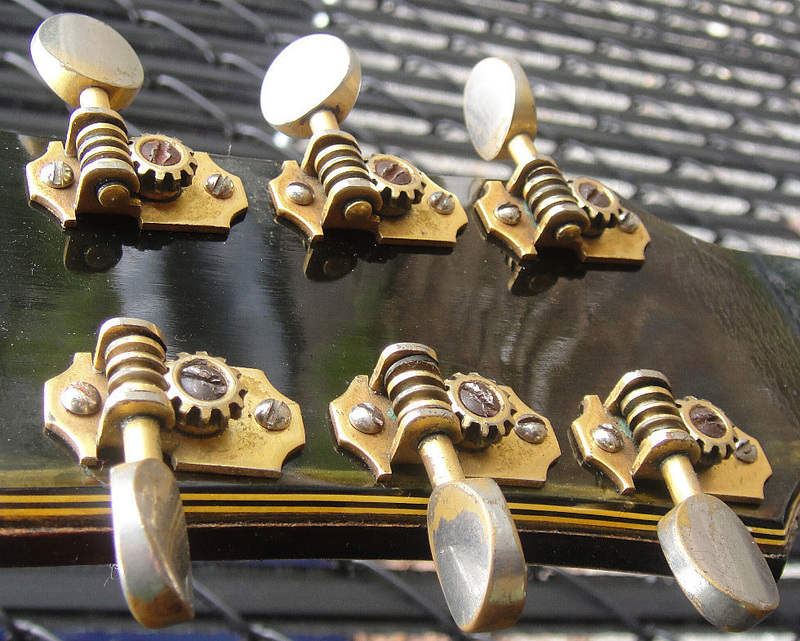 Gold-plated Grover G-98 machines on a 1936 Emperor, with pointed plates and 6:1 tuning ratio. Note that on pre-war G-98 with pointed plate, the scalloped buttons are the thicker variety without a visible seam. Epiphone used G-98 units mostly in the gold-plated version. 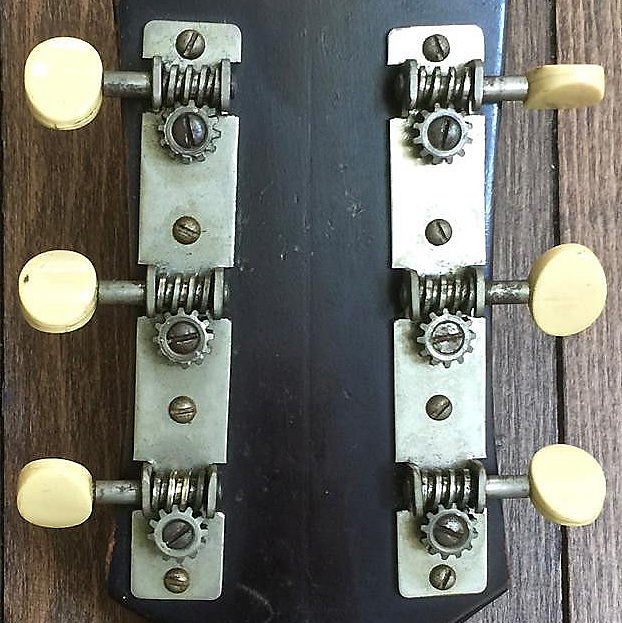 Shown below nickel Grovers with plastic buttons on a 1937 Blackstone – no tuner bushings, as typical for middle and lower Epiphone models in this period. Tuning ratio 6:1. Below two Grover G-98 – a pre-1938 example with 6:1 tuning ratio (right), and a later 12:1 ratio example (left). Both have 12-tooth cog wheels, however different worm screws: Note the steeper angled thread on the right – a double-helical thread moving 2 teeth per turn to achieve a 6:1 ratio. The 12:1 ratio example on the left sports a flatter-angled, single-helical thread. Generally, higher ratio tuners tend to be less prone to slipping. Note another detail to distinguish the two versions: on 6:1 tuners (right) the plate is beveled – no bevel on 12:1 examples (left). Below nickel Grovers with 12:1 ratio and oval metal buttons, on a 1939 Triumph. 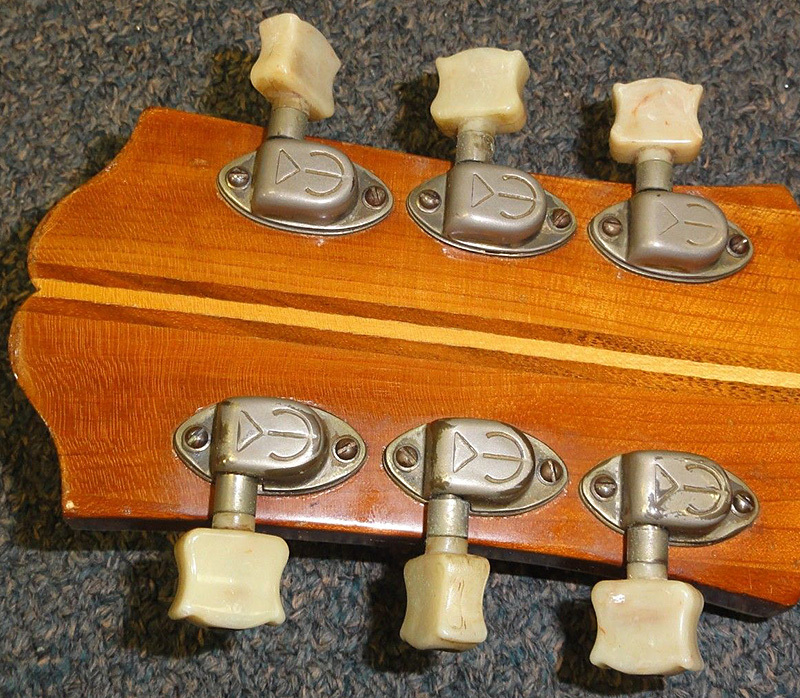 In 1939, single tuners made by Kluson start to show up briefly – mostly on the Triumph and some electric Spanish models. 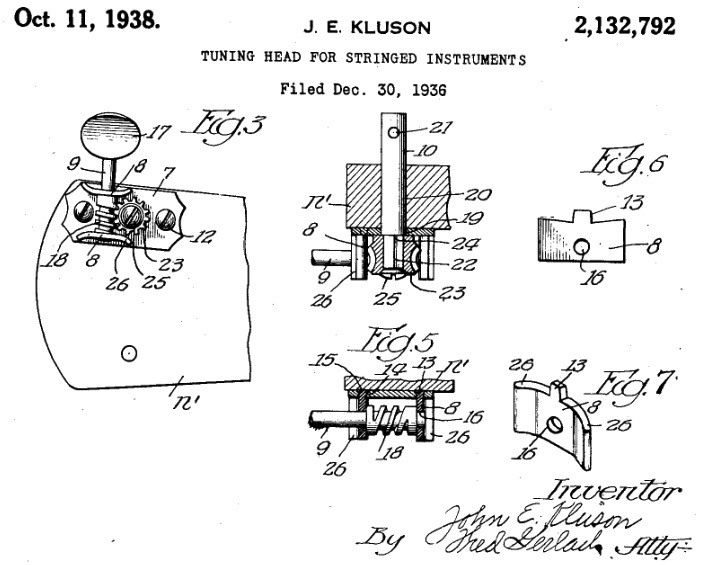 In late 1936, John E. Kluson had filed a patent application for this tuner design, which was granted in 1938 (see picture below). 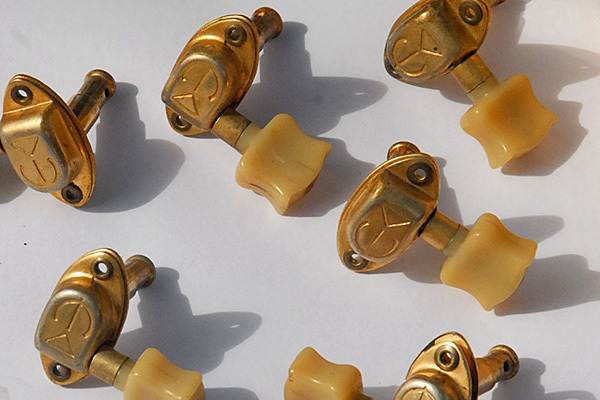 Other Kluson-made tuners would be introduced by 1943 – see part 2, tuners 9. and 10. Below Kluson tuner model "No. 105" as it appeared in the 1939 Gibson catalog AA. Single Kluson tuners on a 1939 Zephyr Spanish (above), and on a 1939 Triumph (below). 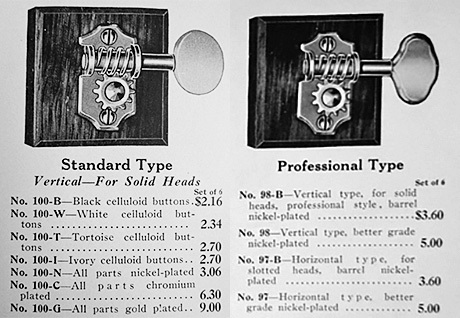 In the 1939 catalog, the "new Epiphone enclosed tuning heads, gear ratio 16 to 1" were announced – see picture below. 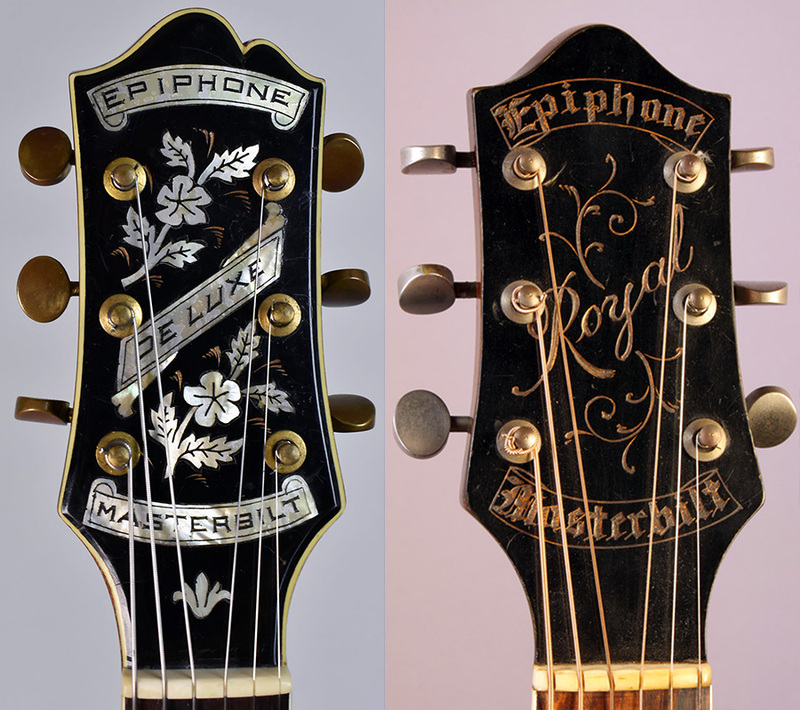 While other tuners appearing on Epiphone instruments were standard products of the respective manufacturers and also used by other customers, these enclosed units were custom made for Epiphone – and branded with the "E"-logo the company started to use in 1939 (also on cases, see Close-up #43). 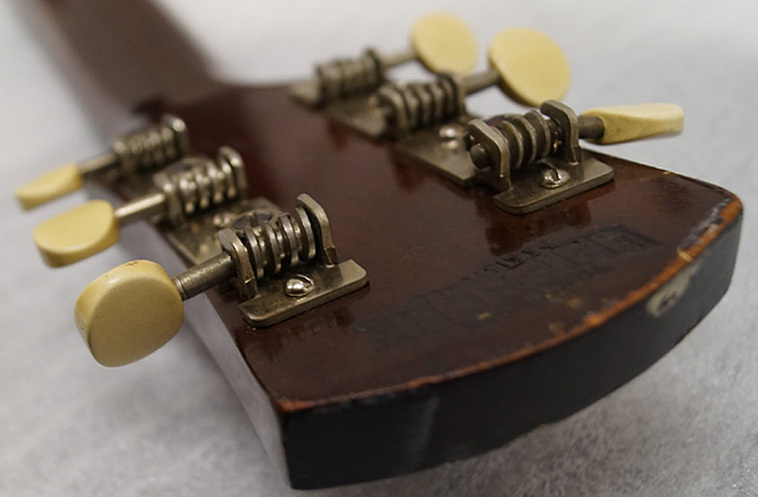 While available as option in 1939, the enclosed tuners didn't become standard on new instruments before 1940 – however many older guitars were upgraded to the new machines by their owners. 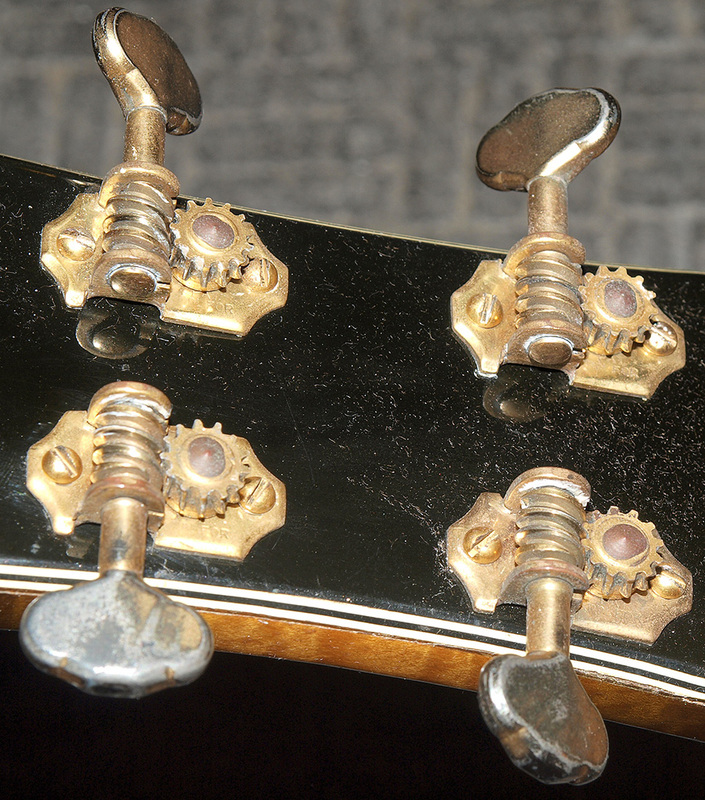 The enclosed tuners were subsequently used on all higher-end models into the 1950s. 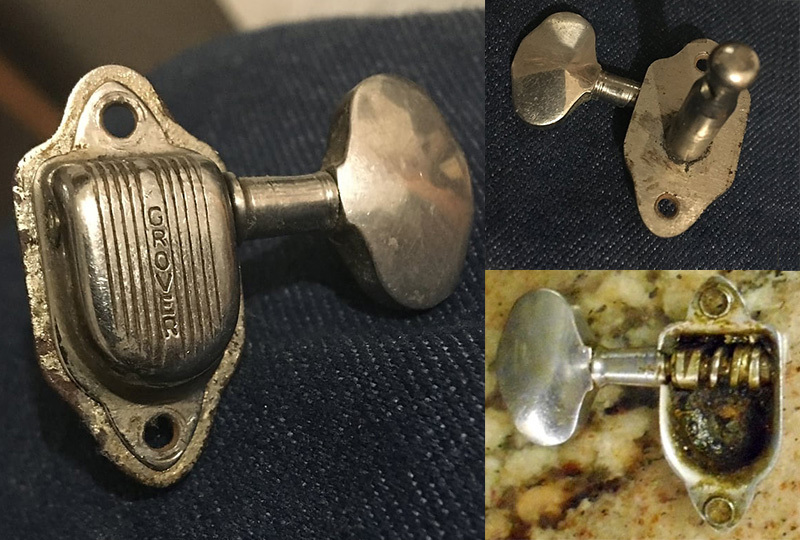 Gold plated Epiphone enclosed tuners on a 1939 DeLuxe (top/left), nickel plated on a 1941 Triumph (bottom/right). Note the round bushings. ... but then I came across these pics below of a Grover G-111 – an enclosed tuner seen on some high-end pre-war Martins (thanks, Tony Hendrix! 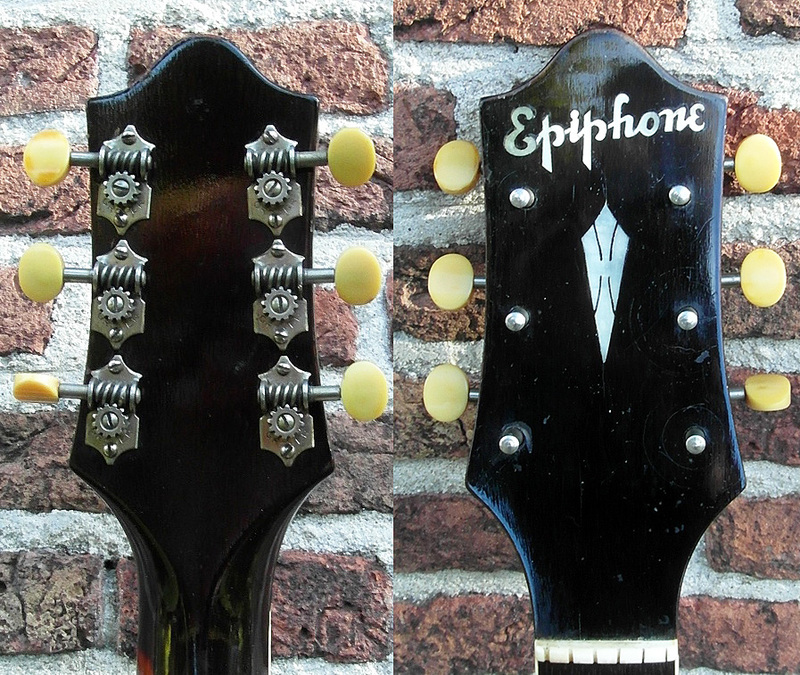 ): Some strong similarities to the Epiphone enclosed tuners, too! So, who manufactured the Epiphone units? I leave this question open. The table below summarizes tuners typically found on acoustic archtop models per year. For later tuners see summary part 2. For detailed tuner info of any Epiphone model see models. Abbreviations: go=gold plated, ni=nickel plated, scal=scalloped metal buttons, met=metal oval buttons, white=white plastic buttons. Note: This overview is subject to updates whenever new evidence surfaces.